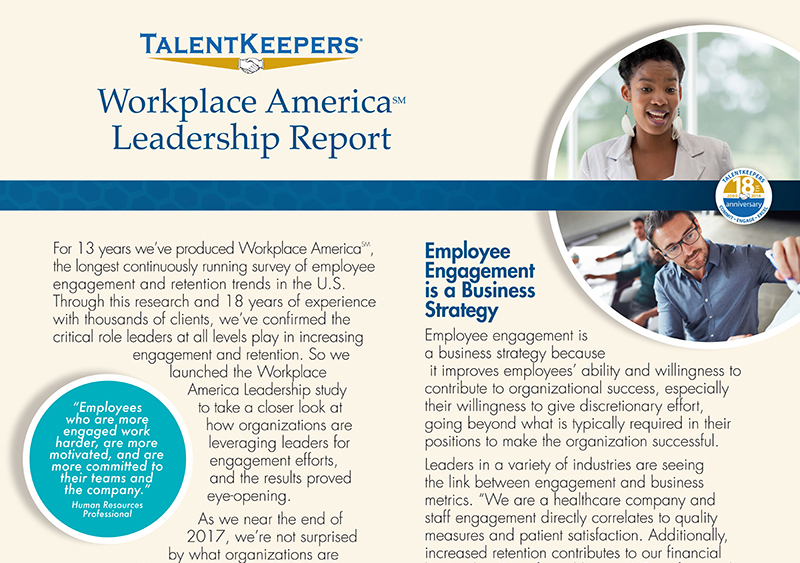 Hello Friends of TalentKeepers, I’m very pleased to announce today the release of our first annual Workplace America Leadership Report,. This leadership research is an insightful look at how organizations are using their leaders for engagement efforts. For 13 years we’ve produced the longest continuously running survey of employee engagement and retention trends called Workplace Americasm. Through this research and 17 years of experience with our clients, we’ve learned the critical role leaders at all levels play in increasing engagement and retention. So we decided to take a closer look at how organizations are using leaders in their organizations for engagement efforts. We launched our survey in September 2017 and over 350 organizations responded, with 64% of participants employing over 1,000 employees. Now as we near the end of 2017, we’re not surprised by what organizations are telling us about the state of employee engagement in the workplace. As we saw during our Workplace America study published last spring, organizations are realizing the challenges of employee engagement and retention are not going away anytime soon. Just 54% of survey respondents believe their strategic plans for engagement are working. That’s a lot of room for growth! However, the research also showed only a disappointing 36% of organizations are taking steps to develop leaders to drive engagement. Leaders need to be trained in employee engagement skills and must understand their role in retaining and motivating people. The first step in leveraging leaders is determining how well they are currently doing and understanding specifically what training they need to become successful. Leaders are critical in the battle to engage and retain talent. The importance of holding them accountable for this part of their role cannot be overstated. Unfortunately, only 21% of organizations hold leaders accountable with significant consequences for not meeting employee engagement goals. We believe every leader should have engagement and retention goals, incentives to meet those goals, and consequences for failing to do so. Check out more about our research here and download a free copy of the Leadership report.